Michel Guérard was born in Vétheuil (Val d'Oise), on 27th March 1933, and comes from a family of butchers and livestock farmers. He spent the Second World War, the Occupation and the Liberation in Normandy, where he began attending secondary school in Rouen in 1947. Michel Guérard wanted to study medicine, but the immediate post-war period was a difficult time so he ended up taking a different path and became an apprentice pastry chef with Kléber Alix, a caterer based in Mantes-la-Jolie, in 1950. In 1956 he was appointed head pastry chef by the Hôtel de Crillon in Paris and, aged just 25, he won a Meilleur Ouvrier de France (M.O.F. Pastry-making) award in 1958. He later went on to become head pastry chef at the Lido, also acting as a chef for private receptions given by the owners, the Clérico family. He then began cooking at various large Parisian restaurants such as the Lucas Carton, Maxim’s and La Pérouse. In 1965 he opened the Pot-au-Feu, in Asnières-sur-Seine, winning his first Michelin star in 1967 and then a second in 1971. The restaurant soon became hugely successful and a major landmark on the Parisian gastronomy scene, with French and foreign politicians, artists, journalists all rushing to dine there. From 1970 to 1972, Paul Bocuse, Roger Vergé, the Troisgros brothers and Michel Guérard became the standard bearers for French Cuisine in the United States and, together with Alain Chapel, Alain Senderens and Jean Delaveyne, they are considered the founding fathers of the French culinary movement which was the global forerunner of “French Nouvelle Cuisine”. In 1974, he joined his wife, Christine Barthélémy, in Eugénie-les-Bains, a miniature spa village in the Landes region. 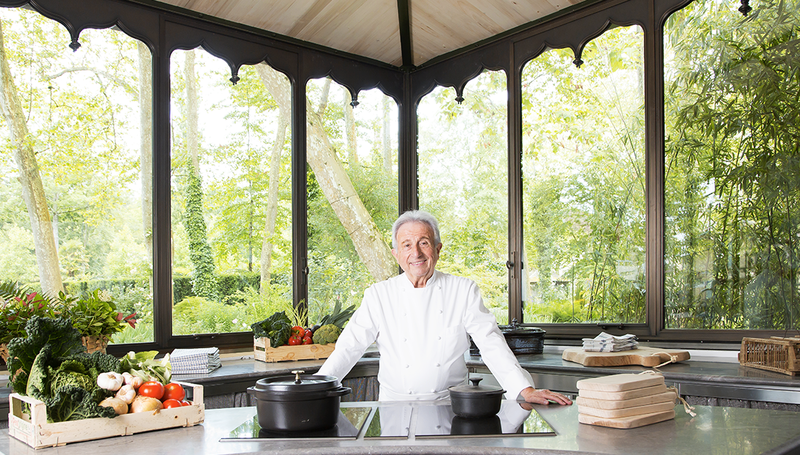 Grasping the needs of his new clientele, Michel Guérard created the Grande Cuisine Minceur® in 1975, and Eugénie-les-Bains went on to become the “Premier Village Minceur de France” (France’s Number One Slimming Village), an innovation which earned Michel Guérard an appearance on the front of Time magazine in 1976. At the same time he won a first Michelin star for the Grande Cuisine Gourmande he was serving at Les Prés d’Eugénie in 1974, followed by a second in 1975. The Les Prés d’Eugénie – Michel Guérard restaurant was awarded a third Michelin star in 1977 and, at the same time, Michel Guérard joined the Chaîne Thermale du Soleil, France’s leading spa group, chaired by his wife. Since 2004, he has been working on giving thermal medicine an unusual, innovative mission, which he presented to the Ministry of Health, dealing with new public health issues such as diabetes, obesity and cardiovascular diseases. The setting up of therapeutic education programmes for patients is one notable result of this. In 2010, Michel Guérard was asked to give a talk at the symposium held to finalise the third part of the 2011-2015 PNNS (Plan National Nutrition Santé – National Health Nutrition Plan) by Professor Hercberg, the Chairman of the PNNS, and Professor Basdevant, the man in charge of the Obesity Plan. In 1976, Michel Guérard became an international consultant to the world’s leading food firm, Nestlé, for Findus, Maggi, Chambourcy, Gervais, Sopad, La Laitière, Buitoni, etc. products. He put together the Findus-Guérard food range and, a little later, the Findus Cuisine Légère range. This was the first time – after Auguste Escoffier – that a major French chef had agreed to bring his know-how to an agro-food group, with the aim of improving the quality and diversity of products on the mass market. The partnership lasted for almost 30 years. He also created a brand of chocolate (“Less Sugar”) in the United States which – in the space of just three years – became the number two foreign chocolate brand on the American market. In 2009, Michel Guérard first began talking about the idea of a healthy cooking school, The Ministry of Health immediately became interested and organized a steering committee, chaired by Michel Guérard and made up of experts from the scientific community. Their workn compiled in a White Paper, entitled Cooking, Health and Pleasure, collected all of the medical and scientific data on both nutrition and the related pathologies (obesity, diabetes, cardiovascular diseases and eating disorders linked to cancer and aging), along with dietary recommendations.